Everything About Coffee! - Opinions, setups, local roasters and the like. The title basically sums up this thread... I'd love to know your coffee setups (equipment), favorite coffee so roosters etc. Re: Everything About Coffee! - Opinions, setups, local roasters and the like. I use to drink Frappés all the time, but nowadays I'm basically a 6oz cappuccino drinker. I have a Nespresso machine for when I have no time to make anything else, aside from that I just use a French Press. Thanks... Sure costed a pretty penny though. Whatever works... works TBH. French press is pretty good, had one for a bit but gave it away when I got my current machine. - Just takes a bit of time to roast. illy is actually pretty decent stuff, but it is super expensive for the quantity that you get. The roast I'm using right now isn't much more than $10/lb, which is very respectable for its quality. So to any coffee drinkers here in the US, I recommend anything from either Paradise Roasters or Red Bird Espresso. Both are very well respected roasters that are known for their wonderfully low prices. Yeah the price is rough. Would be better if they actually filled up the entire damn can- their vacuum system is awesome but sub 20 bucks for a 3/4 at best full jar....bah. TR1 wrote: Yeah the price is rough. Would be better if they actually filled up the entire damn can- their vacuum system is awesome but sub 20 bucks for a 3/4 at best full jar....bah. Yeah.... They charge roughly $2 per 1 oz which is ridiculous (Amazon prices). The Coffee I'm drinking now (which I buy in large quantities of 5lb) costs me $47 for one month of it. I am no big coffee drinker but such big pile of money just for hot water over coffee beans i find it unreasonable. Werewolf wrote: You junky, Mike! To each his own... I'm not so much "addicted" to coffee as I have a passion for it. The process of making it and drinking it are a pleasure... to me at least. That being said, many members of my family have been coffee drinkers/connoisseur so that might be a factor. 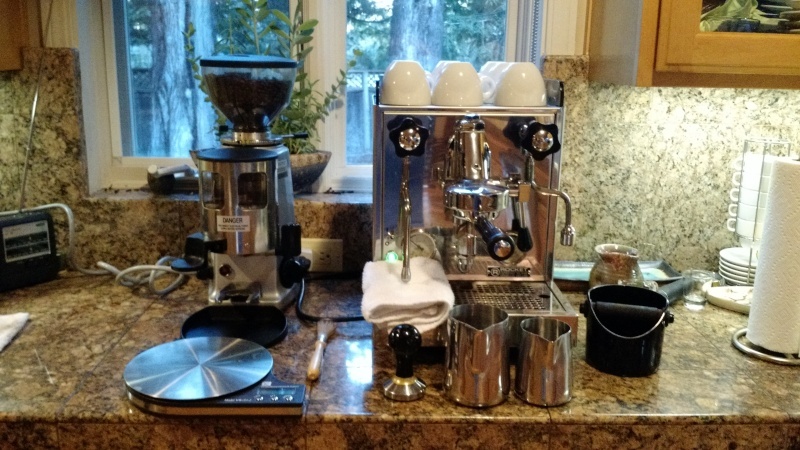 Your espresso setup is very impressive. I'd like to add that my favorite local roaster here in the Bay Area is Verve, if any of you guys know who they are. yeah, ice cold water in the morning is enuff for me, or maybe some ersatz instant sludge .